Everyone wants to perform their best in competition. In order to have that performance not only do you have to have the physical abilities to do it, you need the mental capabilities in order to achieve success. The coined term 'being in the zone' is easier said than done. To be 'in the zone' that means you (the athlete) has total control without having to be in control. Hard effort feels effortless, goals are clear, confidence is high, the inner voice saying no is absent, nothing matters but the competition. Having this mindset is the key to performing to full potential. In order to achieve this state of mind, it is important to know how to handle the stresses of competition. To do that you need to CONCENTRATE, BE CONFIDENT, STAY COMPOSED, and COMMIT. Concentration - staying focused on the task at hand. Don't let distractions from anxiety or fatigue disrupt your concentration. Be aware of any distractions and keep them out with positive self-talk, imagery and relaxation. Confidence - Believe in yourself and your skills. Being confident has a lot to do with a positive attitude but it also means you know how to react to the doubts and worries by understanding how those doubts and worries can be handeled effectively. Stay confident by knowing you competition plan, positive reinforcement, and constructive criticism. Composure - Be in control of your emotions. Know that you can not always control what happens to you during competition but know that you can control how you handel it. Be aware and mindful of your emotions. Commitment - Endurance sports requires considerable amount of commitment to achieve success. Make sure you are in this sport for reasons that are meaningful to you. Wether it is a dream, desire or motivation know you are commited and you chose and want to do this. Remind yourself! This weekend 3 TriAttic Athletes will be testing their physical and mental strengths. Laura Register and Karen Munoz will be running the St. Augustine 1/2 Marathon and I (Coach Sandy) will be running the Marathon. The race starts at 6:15 am on Sunday morning. 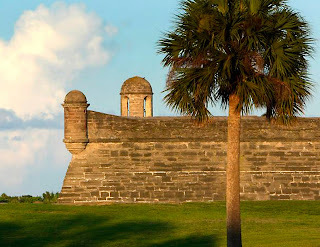 The start and finish is located downtown near the Castillo de San Marcos Fort. The course is said to be scenic and flat. Saturday forecast calls for a low of 62 and Sunday is forecast to be party sunny with a high around 76. Best of luck to everyone racing this weekend. Be strong and confident. Everyone has done the physical preperation to achieve your goals now concentrate on the mental game. "GET IN THE ZONE"